I want to start this review with a scandalous disclosure: I’m kind of lukewarm on the Marvel Cinematic Universe. Shocking, I know. I’m a white male between the ages of 18 and 39, I write for a geeky pop-culture news website, I have shelves overflowing with action figures, and yet I’m still somehow indifferent to the now-constant barrage of Marvel superhero feature films and tie-in television series. To be perfectly frank, I’m more of a Star Wars guy. Still, I have managed to see (I think?) all of the Marvel Studios movies so far, and some episodes of the current TV shows, and I read my share of the comics growing up, so I’m not totally lost on the identities of the characters and their motivations. I just happen to believe that even when the MCU is at its absolute best (say, in James Gunn’s “Guardians of the Galaxy” or Jon Favreau’s first “Iron Man,” for example) the series still never quite transcends the status of above-average action-adventure, to me. Despite this general apathy to Marvel movies, I approached “Captain America: Civil War” with an open mind and, yes, even a modicum of excitement. I (probably undeservedly) got to be in one of the first, if not the very first, audiences to see it, and I tried my darndest to appreciate that fact. Even in a theater filled with the most hardened, disenchanted film critics in Los Angeles, the buzz was palpable. We were about to see the latest blockbuster entry in what will likely be remembered as one of the defining cultural movements of the early 21st Century. And I have to say that by the time the credits finished rolling and we walked out of the theater, I had come to genuinely enjoy the experience. In the past, one of my big issues with the Avengers has been that they seem to be the cause of many of their own problems. Thor paved the way for his devious brother Loki to invade Earth across the Bifrost, Tony Stark created Ultron in a misguided attempt at automating his own global peacekeeping capabilities, and the Hulk causes more destruction than he prevents. Which is why it pleased me a great deal to see this very issue addressed right at the top of “Civil War,” the third entry in the “Captain America” series, and the thirteenth movie overall in the MCU. 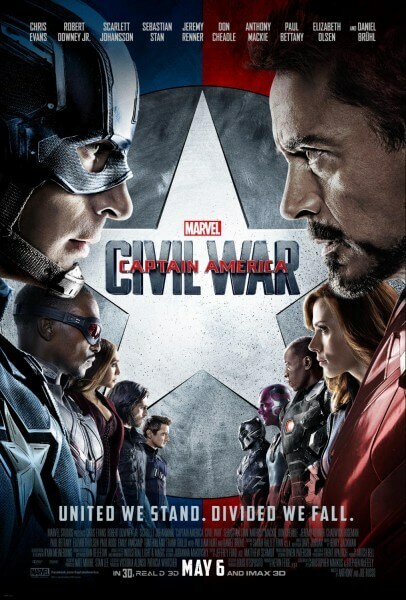 “Civil War” opens with a tooth-and-nail showdown on foreign soil between a select group of Avengers and the villainous Crossbones, as part of a desperate hunt for Captain America’s former friend Bucky Barnes (Sebastian Stan,) AKA the brainwashed Winter Soldier. The fight ends with the reality-bending Scarlet Witch (Elizabeth Olsen) accidentally demolishing part of the city, and as a result the Avengers are called on by Secretary of State Thunderbolt Ross (William Hurt) to undergo extensive governmental oversight. This prospect divides the group, with Tony Stark / Iron Man (Robert Downey, Jr., delightful as always) in favor of toeing the line, and Captain America (the ever-stalwart Chris Evans) predictably erring on the side of freedom. 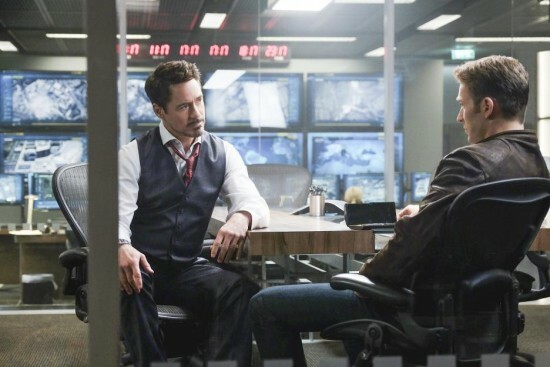 The movie gets bogged down a bit in its second act: there’s a lot of talky political debating about whose loyalties lies where, and a continued search for the Winter Soldier that hews a little too closely to the plot of the previous “Captain America” entry. But once the two teams are established and the battle lines are drawn, it’s pretty much non-stop excitement for the entire second half. 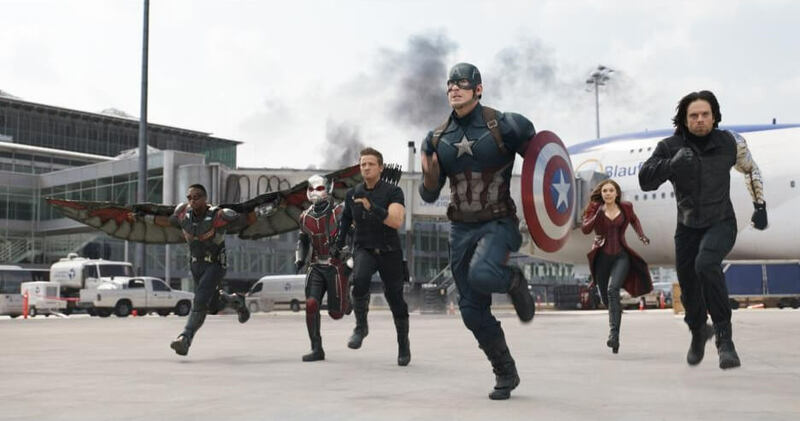 “Civil War’s” much-ballyhooed centerpiece is an all-out brawl on an evacuated airport tarmac featuring just about every character who had been previously glimpsed or even mentioned in the movie, and some new ones too: Paul Rudd’s Ant-Man shows up to lend a hand to Captain America, the steely Black Panther (Chadwick Boseman) pitches in on Team Iron Man because of a personal vendetta against Barnes, and even a friendly neighborhood Spider-Man gets enlisted by Tony Stark to join in on the melee. This prolonged sequence is where the movie really kicks into high gear, and from that point on it never lets up. 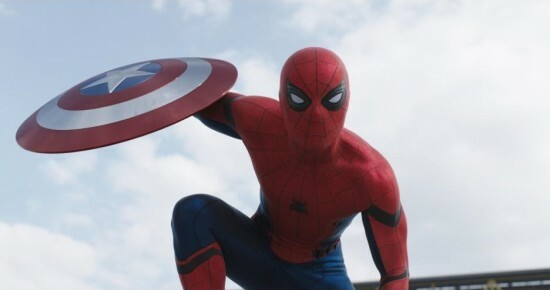 By the way, although his screen time is limited here, it’s not a difficult call to predict that Tom Holland’s Spidey will be heralded as a victorious, comic-book-accurate take on the character when he gets his own solo movie in the summer of 2017. He’s easily one of the highlights of “Civil War,” and a breath of playful fresh air in a franchise that has the tendency to get mired in its own self-seriousness. Naturally it all comes down to Captain America vs. Iron Man (with a furtive manipulator pulling the strings, of course) and the movie’s climax touches on themes and emotions deeper than anything we’ve glimpsed before in a Marvel movie. The final knock-down, drag-out clash between the two main heroes is both cathartic and exhausting, because we agree with both of them and we don’t want either of them to overpower the other, either physically or ideologically. It’s a breathtaking setpiece that infuses raw passion into the action, something I had felt the MCU was lacking until now, and it single-handedly sold me on the movie. I’ve previously (and snidely) remarked to friends that the Russo Brothers have a small-screen sensibility that doesn’t translate well to CinemaScope: their shot composition is often artless and the color palette for their Marvel output has been drab. That opinion held true for me through the first half of “Captain America: Civil War,” but by the end I was almost ready to call myself a convert. If they can hold onto what made this movie’s finale work so well, if they can continue to harness that energy and channel it through the voices of their characters, then the upcoming two-part “Avengers: Infinity War” might be something I can really bring myself to get excited about. “Captain America: Civil War” opens in theaters nationwide on Friday, May 6th. All images Copyright 2016 Marvel / Disney. …and there is already the parody!!! Gonna see this movie in bout 2 weeks time…cant wait. Its annoying to read that u as someone who’s not a big mcu fan got to go to the 1st screening..but i do see your point..that i too feel most of mcu flicks havent been that satisfying as individual complete movie on its own. Dso ever since dark world ive started to see the rest of em as one long contiuation of one huge series..and each movie as merely an episode..much like i do with game of thrones. It does elevate my experience. Newer Newer post: Sony’s “Emoji” movie is an actual thing that is happening. Because reasons.